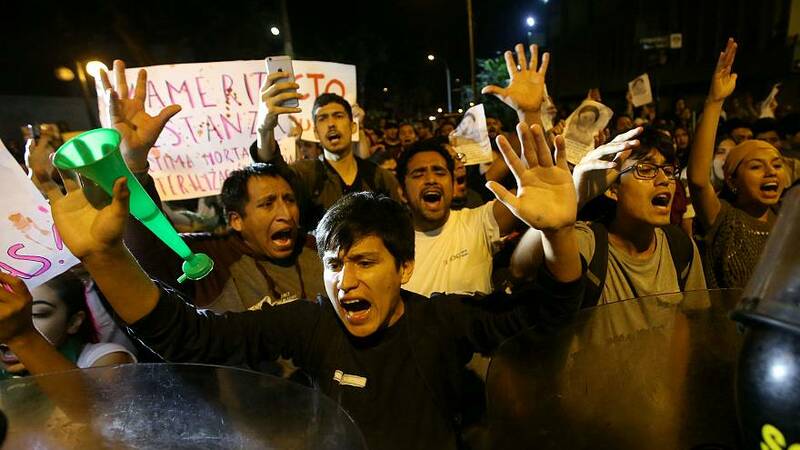 Hundreds of Peruvians fill the streets of downtown Lima for a second day of protests over a pardon granted to former leader Alberto Fujimori. Making their way to the clinic where Fujimori is being treated, they chanted "traitor" and "the pardon has got to go," as police used tear gas to disperse the group. The pardon threatens to pitch President Pedro Pablo Kuczynski's center-right government into a new political crisis less than a week after he narrowly escaped being forced from office by Congress in the wake of a corruption scandal. President Kuczynski defended his pardon for Alberto Fujimori on Monday as justified clemency for an ailing man whose authoritarian government in the 1990s helped the country progress. Addressing Peruvians for the first time since pardoning Fujimori on Christmas Eve, Kuczynski appealed to Peruvians protesting his decision to “turn the page” and accept it. The pardon has pitched Kuczynski’s center-right government into a fresh political crisis less than a week after Congress nearly removed him from office in the wake of a corruption scandal. Fujimori, who like Kuczynski is 79, is a deeply divisive figure in Peru. While many consider him a corrupt dictator, others credit him with ending an economic crisis and quashing a leftist insurgency. The pardon cleared Fujimori of convictions of corruption and human rights crimes during his rule, 12 years into a 25-year prison sentence. Fujimori was rushed to the hospital on Saturday (December 23), where he remains in intensive care to treat a drop in his blood pressure and an abnormal heart beat. Kuczynski, a former Wall Street banker, reiterated that the pardon was a response to fears that Fujimori might die in prison. But - for the first time since running for office a year ago - he also defended Fujimori’s decade in power. “It’s clear his government, which inherited a country submerged in a violent and chaotic crisis at the start of the 1990s, incurred in significant legal transgressions regarding democracy and human rights. But I also think his government contributed to national progress,” Kuczynski said in a televised address. The remarks placed Kuczynski more firmly on Fujimori’s side of Peru’s biggest political faultline, and triggered a fresh wave of criticism of Kuczynski from Fujimori’s foes.